The three-film saga (The Street Fighter, Return of the Street Fighter, The Street Fighter’s Last Revenge) of assassin and antihero Tamuka “Terry” Tsurugi (Sonny Chiba), a legendary martial artist with his own distinct moral code who frequently finds himself at odds with the mafia. When that happens, a substantial body count of dead killers ordered to hunt Tsurugi down inevitably ensues. After being hired to break out a notorious killer from prison, when the man’s siblings are unable to pay him for his work Tamuka Tsurugi kills the younger brother and sells the sister into prostitution. 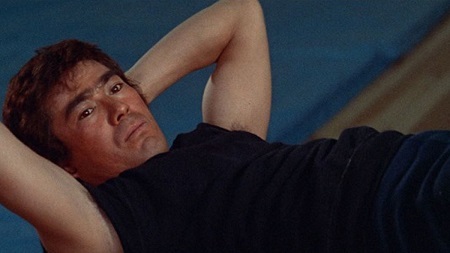 Later, after he refuses to assist in the kidnapping of a young heiress, he instead convinces her protector, respected martial arts master Kendo Masaoka (Masafumi Suzuki), to allow him to shadow the woman during her travels in order to keep her safe from harm. What Tsurugi does not know is that the mafia is involved in this game of subterfuge and death, and they mean to make sure this notorious street fighter doesn’t get the opportunity to spoil any of their plans. The first film in The Street Fighter trilogy is a total hoot, with many considering it to be the best of the trio. Featuring plotting that goes beyond being simplistic in order to focus almost entirely on the numerous bone-crunching martial arts battles Tsurugi finds himself embroiled in. This is all well to the good, and it’s easy to see why this series has garnered so many fans over the decades (including, probably most famously, Quentin Tarantino). As for Chiba, he became an international sensation after the release of this film and its sequels, his ferocious raw intensity a truly wondrous thing to behold. 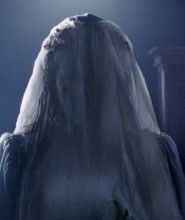 This is the uncut international version of the film. Tamuka “Terry” Tsurugi returns to action after he is hired to assassinate a pair of accountants. Turns out, they’re involved in an illegal fundraising scheme involving a fictional martial arts school, the mastermind behind it all embezzling funds utilizing a variety of methods which include both blackmail and murder. It gets worse when Tsurugi discovers the mafia is in on this deal as well, and they’ve brought back an old nemesis he was certain he’d killed in order to do him in. They’re also planning on murdering Masaoka, the wise martial arts master an additional hinderance to their overall plan who cannot be allowed to live. Even more nonsensical than its predecessor, I actually enjoy this sequel a bit more than I did the first film. The action is even more spectacular and some of the deaths are literally eye-popping in their gruesome excess. The final 15 minutes is an extraordinary cacophony of carnage and bloodshed that showcases Chiba in all his viscerally violent glory. It’s idiotic from a story standpoint, there’s not denying that, but none of that makes the overall movie itself any less entertaining. I like this one a lot. This time out, Tamuka “Terry” Tsurugi is hired by a shady businessman to extract a person of vital importance as well as a mysterious mahjong case from a downtown building currently surrounded by the police who are currently engaged in a shootout with the gangsters within. While successful, his employer thinks he can get away with not paying Tsurugi, which as most should know is nothing short of a major mistake. Now he is in possession of an audio tape that if released would lead to a major political and corporate scandal the effects of which cannot be underestimated. But before he extract proper value for this recording it turns out a determined prosecutor also wants to get his hands on it as well, and if Tsurugi wants to get revenge against those who wronged him he’s also going to have to deal with this mysterious law officer, a lethal martial artist himself, as well. While featuring its fair share of incredible action, this is one entry in the Street Fighter series I can’t help but mildly scratch my head about. There’s a dude in a golden sombrero who has a laser weapon. There’s a talented young female martial artist who is quickly introduced only to be casually disposed of in a manner that’s unduly cruel and oddly thankless both at the exact same time. The film doesn’t real feel all that connected to its predecessors other than a brief cameo from Suzuki, returning as Kendo Masaoka, where he gives Tsurugi insight into how defeating one adversary in a one-on-one bout. It’s kind of a jumbled mess, and I can’t say it held my interest near the same way the first two films in the trilogy did. Still, Chiba is still extraordinary, and the highs still outweigh the lows, all of which means even passing fans will likely want to give The Street Fighter’s Last Revenge multiple looks, just not as many of them as they do either The Street Fighter or Return of the Street Fighter. Both U.S. and Japanese cuts of the film are included with this release. 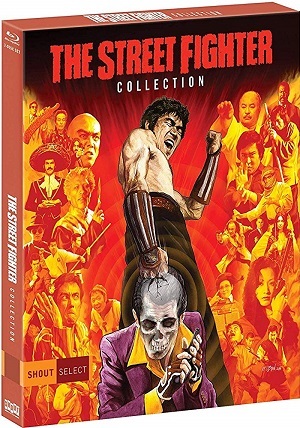 The Street Fighter, Return of the Street Fighter and The Street Fighter’s Last Revenge are presented on separate 50GB Blu-rays (MPEG-4 AVC Video) each sporting 2.35:1 1080p transfers and new 2K scans of a variety of available source elements. Truth be told, none of these films has ever looked as good as they do here, Shout! Factory going above and beyond as far as I’m concerned. Each films comes with dueling English Dub DTS-HD Master Audio Mono and Japanese DTS-HD Master Audio Mono soundtracks and sport optional English subtitles.